If you've been waiting for a smartwatch that looks beautiful in a more traditional sense, your wait might be over. The new Withings Activité is a fitness tracker that can really hold its own in terms of style. 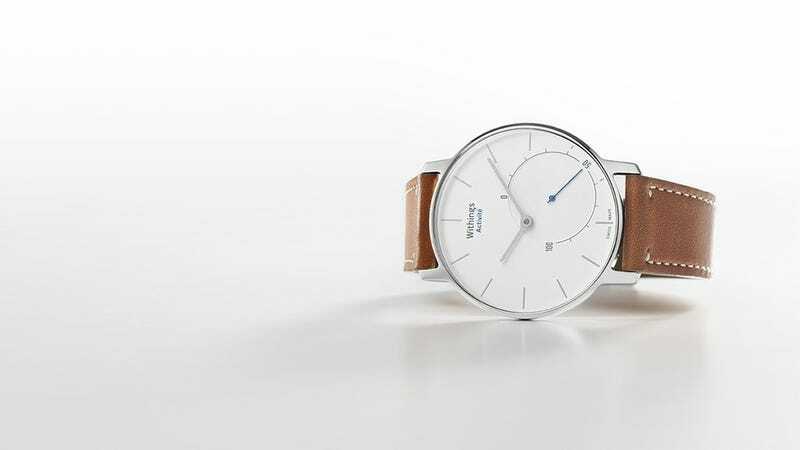 The Swiss-made timepiece from the makers of the Withings Pulse can't show you text messages on your wrist, but it can track the steps you take, the calories you burn, your sleeping patterns, and the distance you've traveled. It comes in both black and white, with a stainless steel case, a nigh-unbreakable sapphire glass face that acts as a simple touchscreen to toggle between settings, and real leather bands you can swap out for plastic ones if you're feeling particularly active. Information that's not the time is displayed on the Activité's secondary face, which can show your percentage progress to a step goal or a sleep goal. Data beyond that is, of course, beamed back to the Withings Health Mate app on your iPhone (iOS only!) for in-depth perusal.